Editor’s note: I am off on my honeymoon and have some amazing guest posts lined up for you guys. 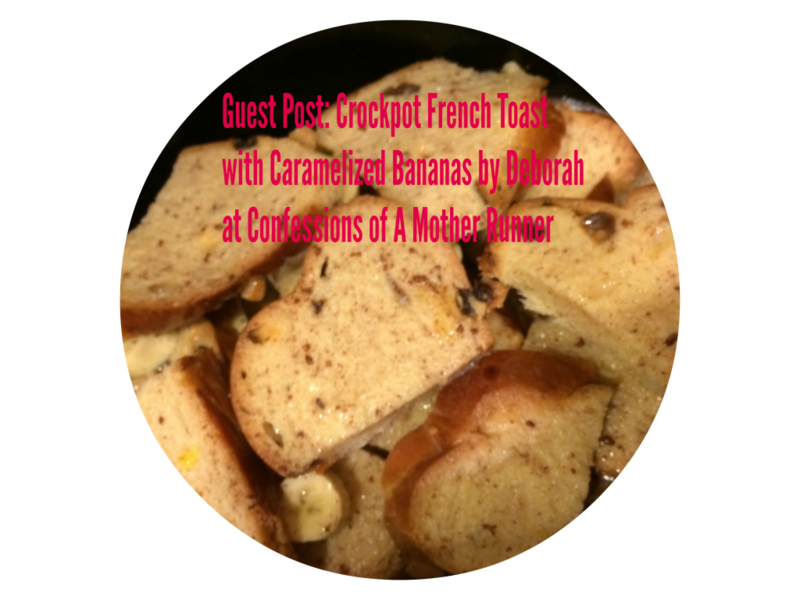 Today, Deborah from Confessions of A Mother Runner is sharing an awesome recipe for Crockpot French Toast – yum! Enjoy! My friend, Courtney, asked me to help her out while she is off on her honeymoon. She is going to be sorry she missed this recipe! With so many relatives and friends dropping by this time of year, I wanted to bring you a dish that you can easily prepare for a great Brunch. I made this as healthy as possible while still keeping the yummy goodness of French Toast. The prep time is 5 minutes so you can easily pop it in your crock pot in the morning and have it ready for Brunch. You can use your favorite healthy bread. I used Raisin Challah Bread this time and it was amazing. 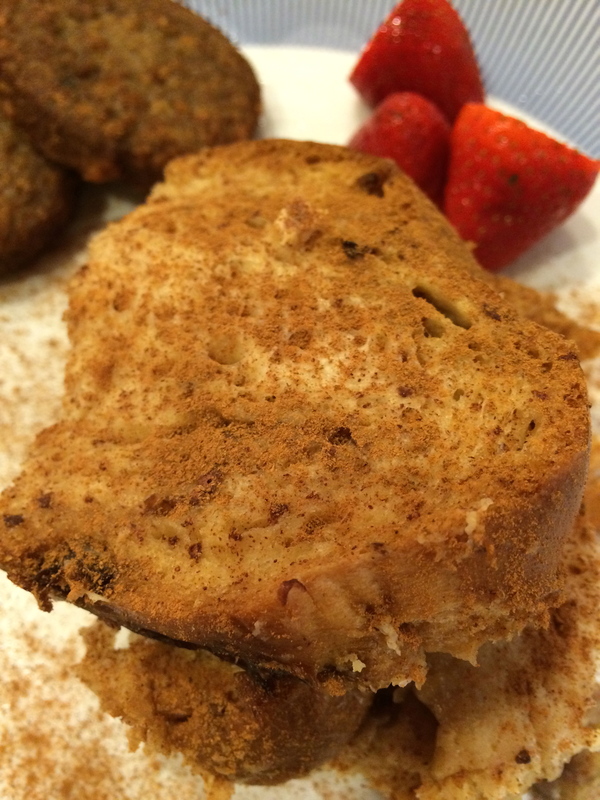 Easy, crockpot french toast recipe! I used Raisin Challah Bread this time and it was amazing. I used the Reduced Sugar Maple Syrup. It pairs well with Strawberries on the side. This was so much tastier than I expected. My family loved it and we even had it for Dinner one night. It would also be great with Apples or Pears as a filling. I will certainly be making this when I have friends for Brunch and I hope you and your family give it a try as well. If you enjoy this recipe, head on over every Monday for my Meatless Monday link up. Thanks Courtney for letting me Guest Blog today and I hope you are having a fabulous Honeymoon. Deborah writes the blog Confessions of A Mother Runner. She is a mom of 2 teens, Moms Run This Town Chapter Leader, Girls on The Run coach, Rock n Roll Race Ambassador . She likes to blog about running, fitness and vegetarian living and you can find her on Twitter and Facebook. Oh, this looks great! Pinned for holiday breakfast! This looks WONDERFUL! Definitely going to make these soon. Hope you enjoy the breakfast! have a wonderful time on your honeymoon! I love raising bread in french toast! I’d never done French Toast in the crock pot but this sounds like a great idea for brunch with guests. Wow this looks delicious!! I was thinking of making French toast this weekend…this looks like a fun new way to use the crock pot! I never thought of making French Toast in the Crockpot! How convenient and it looks like something my little ones would LOVE! Thanks for sharing another great recipe! I have already pinned it for the future!